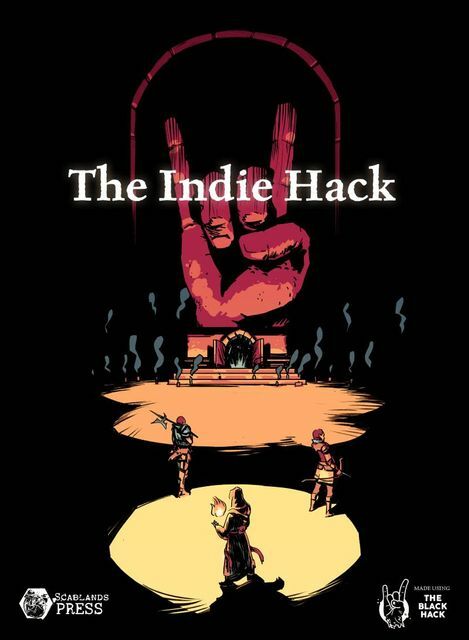 The Indie Hack (TIH) is a minimalist fantasy roleplaying game, build up from the ideas in The Black Hack, that is played with pencils, paper, dice, and imagination. It takes old-school gaming and gives it an indie edge: you get heroes, magic, traps, and monsters but the players get more control over the richness of the story. The characters are ruled not by abstract ideas of goodness and order, but by Masters (who they try to impress) and Goddesses (who they need to appease when they are near death). The characters have relationships with each other and NPCs that mechanically evolve. Players answer class-centric questions about the world during character creation, to help the GM develop the setting and tone of the adventure. There are seven classes to choose from: The Veteran wades through battle. The Exorcist banishes the Unliving. The Hunter can find anything in the wilderness. The Scoundrel bypasses traps and locks. The Elementalist manipulates fire, water, and stone. The Occultist summons up dead things. And The Outlander is... well... different. In The Indie Hack, you don't collect XP, you collect scars. At just 28 pages, The Indie Hack a light-weight way to shift your dungeon-delving paradigm. The Indie Hack (TIH) is a minimalist fantasy roleplaying game, build up from the ideas in The Black Hack, that is played with pencils, paper, dice, and imagination. It takes OSR-style gaming and gives it an indie edge. That is, it takes dungeon delves with heroes, magic, traps, and monsters and gives the players more control over the richness of the story.